Whether it’s a happy hour during the week or a night out on the weekend, your neighborhood bar is ready for you. Local breweries, big chains, or little dive bars are great places to hang out, have a few drinks, and unwind. However, that’s not all they do. Bars and pubs are vital to the lifeblood of the communities they serve. There’s so much more than alcohol and food there. These places tend to be where people socialize, talk about their neighborhood, and even support local musicians and artists. The local drinking spot can actually help your community thrive. There’s a theory called “third space” that fits well with your neighborhood drinking establishment. Your home is your first space; that’s where you spend a lot of your time. The second space is where you work; a place where you probably spend too much of your time. Both are social environments for people. You go home and hang with your family, but you also have your work friends. That leaves a third space — a social environment free from the pressures of home and work. That’s exactly what your local bar or pub does. It gives people room to socialize beyond home or work. It doesn’t have to be a bar, of course. A barbershop, the mall, or even a public library can all serve as a third space. But there’s something special about drinking establishments like local breweries, corner pubs, and the like. They tend to be cozy and comfortable. You can talk with others, even strangers, and be accepted. 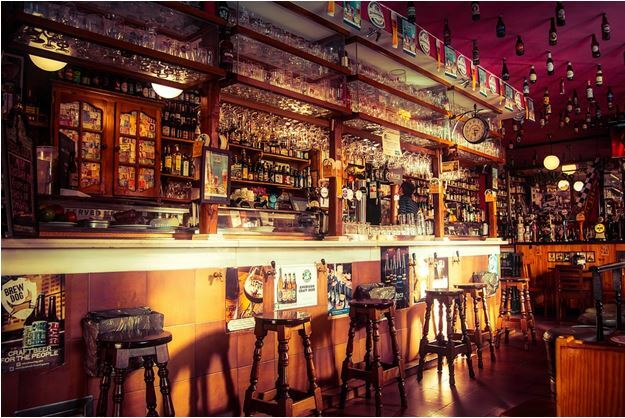 In other words, bars and pubs give your community a place to hang out and have fun together. Because these drinking establishments tend to draw people out of their work and homes, they tend to become local hot spots for a community. More people are heading into local places for conversation and social interaction. And that’s turning these places into hubs of activity and knowledge. Sure, there’s drinking going on. That’s kind of the point of these places. But when the local team is playing a big game, the local bar or pub is packed. Everyone cheers on the home team, and in the process, bonds with each other. These establishments also help local businesses (besides themselves, of course). They bring in people, so they bring those people’s money to the area. Instead of driving miles away to the big outlet mall, people can stay in their neighborhood, have a drink, and then go do that shopping locally. Culture is an important part of our lives. But how many times can you get to the art museum or opera? How many times do you even want to do that? This is where local breweries, bars, and pubs serve the community again. Sure, you can head to the nearest stadium and pay hundreds of dollars to see a popular band. But you can save time, money, and hassle by going to a neighborhood drinking establishment and catching a small, up-and-coming band. These small venues are not just great places to catch music. They’re vital to letting local bands have a space to play. The same is true for artists as well. Big chain bars already have their decor planned out by corporate. But local venues are more likely to show local artists’ work. As with music, this is a great way for area artists to get some exposure — and maybe a few sales. When you’re ready to head out of the night and have a few drinks, make sure you do so responsibly. But consider going to your nearest local bar. After all, this is your community too. Guest Post by Henry Moore. Henry believes travel can change you, and good health preserves you. He combines both in his work on FitWellTraveler.